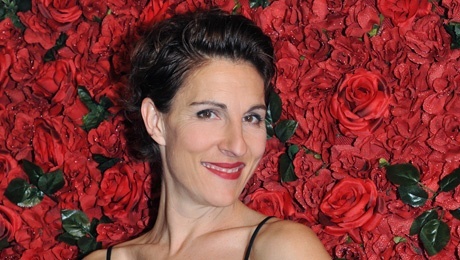 Tamsin Greig took on the role of Pepa in Women on the Verge of a Nervous Breakdown back in November 2014 - marking her musical theatre debut. Despite being most recognised for her roles in hit TV shows Black Books, Green Wing, Friday Night Dinner and Episodes (to name but a few); she's no stranger to the stage. In 2007 she won an Olivier award for playing Beatrice in Much Ado About Nothing and has also appeared in Gethsemane (2008) The Little Dog Laughed (2010), Jumpy (2011) and Longing (2013). With Women on the Verge of a Nervous Breakdown having now extended booking August 2015, there's no better time to look at all the reasons why we love this talented leading lady - and there are a fair few of them! Whether its donning a stethoscope as Dr. Caroline Todd in Green Wing, playing high-flying director Beverly Lincoln in Episodes or ... impersonating farm animals on a popular TV talk show, there's no limit to her talent. If announcing to the whole of the Royal Opera House (oh, and the other few thousands of people watching later on TV) that youve wet your rented frock in excitement - during your Olivier Awards acceptance speech - isnt memorable, we dont know what is! Despite temporarily trading old Blighty for a glamorous LA, she insists that there is truly no place like home. She stars alongside Stephen Mangan and Matt Joey Tribbiani Le Blanc in BAFTA award-winning TV show Episodes, and has become great friends with the pair in doing so. As far as group interviews go, this one is probably the funniest weve read in while. Can you believe that this Olivier Award winner was once rejected for both the National Youth Theatre and then drama school? We cant either. She instead went on to university and graduated with a first in Drama and Theatre Arts. Hows that for proving them wrong? Were not kidding. Those hips don't lie. You can see Tamsin in action at the Playhouse Theatre, where shell be starring as Pepa in Women on the Verge of a Nervous Breakdown until August.